We finally got a break from the hot weather last week, which meant I got the chance to use my oven a few times! Is it bad that I’m already looking forward to fall?! Baking and all things pumpkin….but anyways, on with what I’m here to write about! 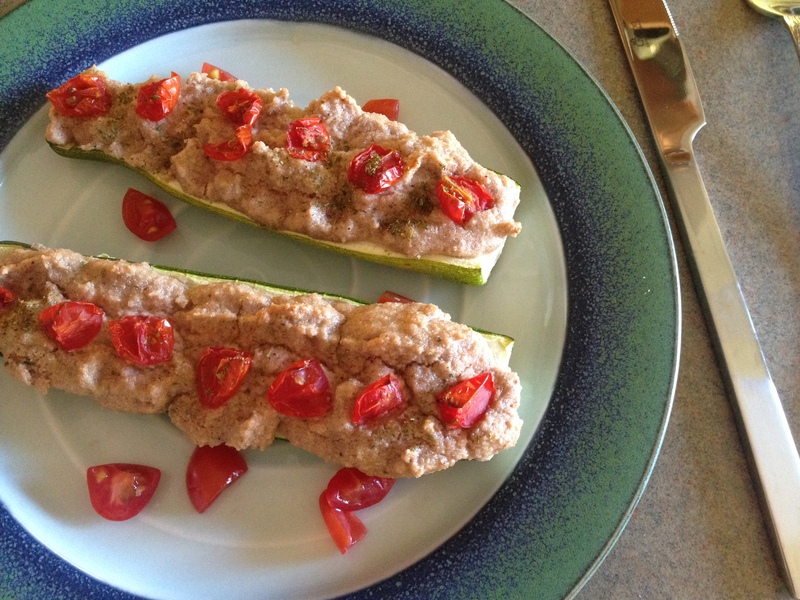 It’s been a LONG time since I’ve made my zucchini lasagna and since we didn’t have all the ingredients on hand to make it, I improvised and created some zucchini boats. As most of you already know, we don’t eat soy, so we rely on nuts and seeds to make “cheeses” and sauces. One of my favorite parts to the zucchini lasagna is homemade “ricotta” because it’s so creamy and flavorful. You can also use any leftover “ricotta” to add to pasta, or I love to eat it with raw carrot sticks. 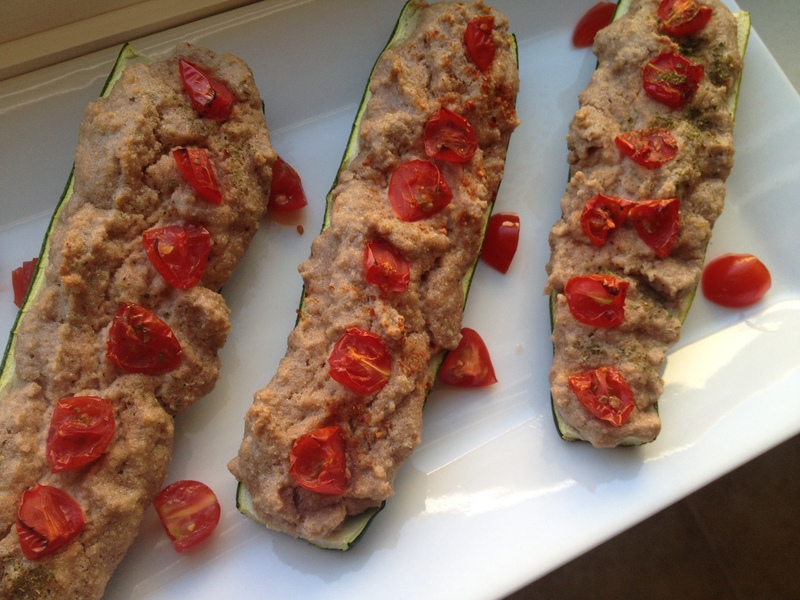 Zucchini Boats all set for the oven! 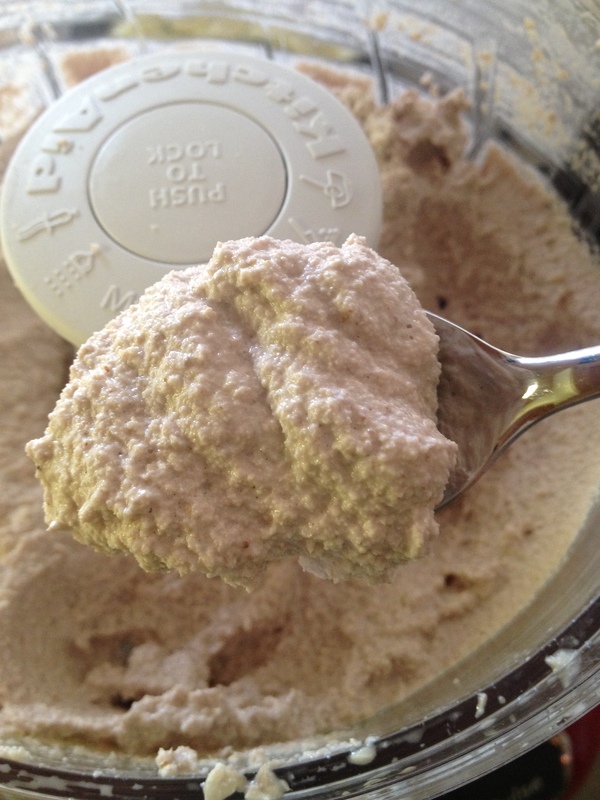 Drain and rinse your walnuts and cashews; put them in a food processor, slowly adding the water (about 1/4 cup to start). Blend until smooth, stopping to scrape the sides, adding more water if needed. You’re looking for a thick consistency, but without chunks of walnuts or cashews; try and get it as smooth as possible. Add in the remaining ingredients and blend again. 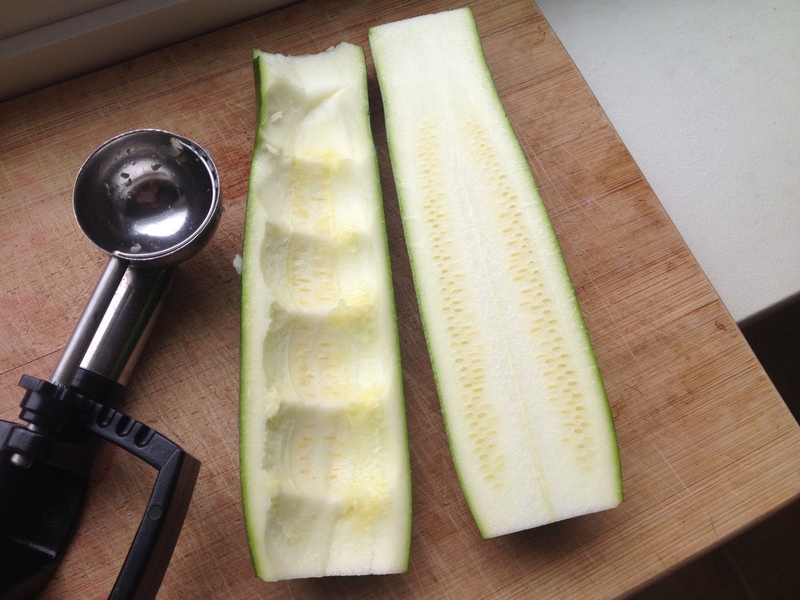 Cut the ends off of your zucchini and slice lengthwise, in half. Using a melon baller or a small cookie scoop (which is what I use), gently scoop out some of the center to allow for the “ricotta” to sit nicely. 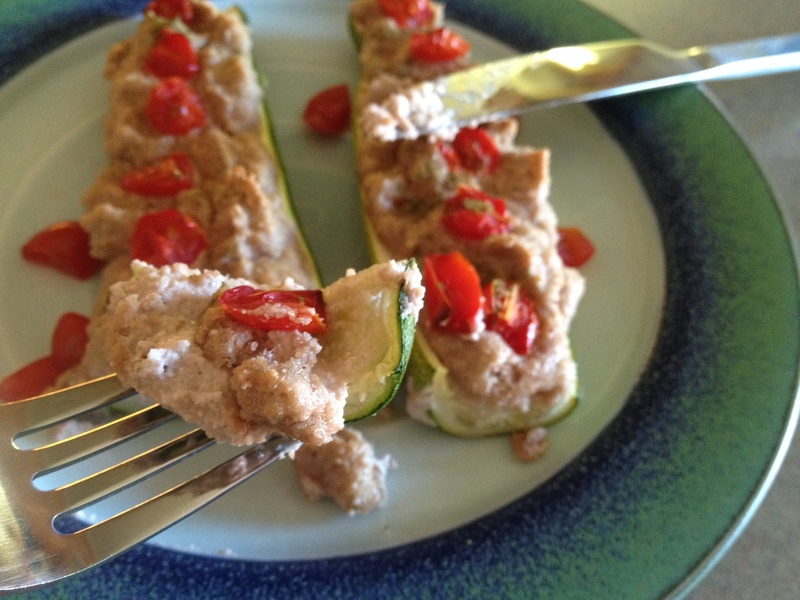 Next, top the zucchini with some of the “ricotta” and any other toppings you wish. I used some organic sugarplum tomatoes and various seasonings. 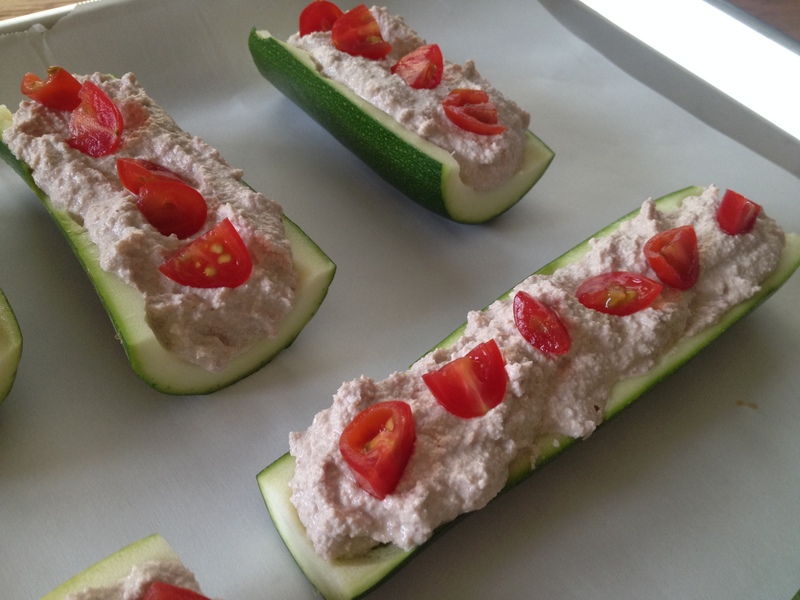 Bake for 35-40 minutes or until zucchini is tender. 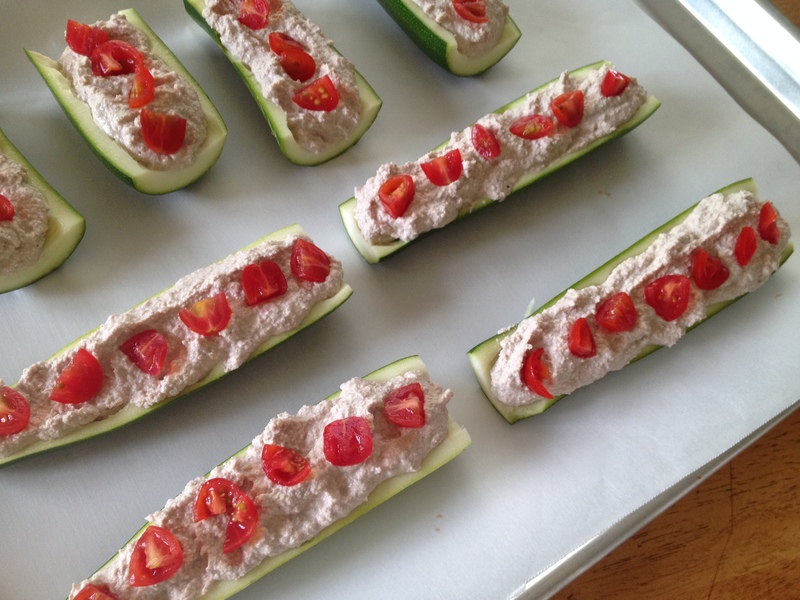 These zucchini boats are a great appetizer or light meal and the toppings are endless! Caramelized onion, roasted garlic, basil…the list could go on! The “ricotta” can also be thinned out to make a creamy sauce to top noodles with. When used to make a zucchini lasagna, it’s easy to keep the dish raw (which we’ve done a few times in years past), but we have found when baked in the oven, it really brings out the flavors more.